Happy Foodie Friday! We have some friends coming to stay with us this weekend. We cannot wait for them to get here! 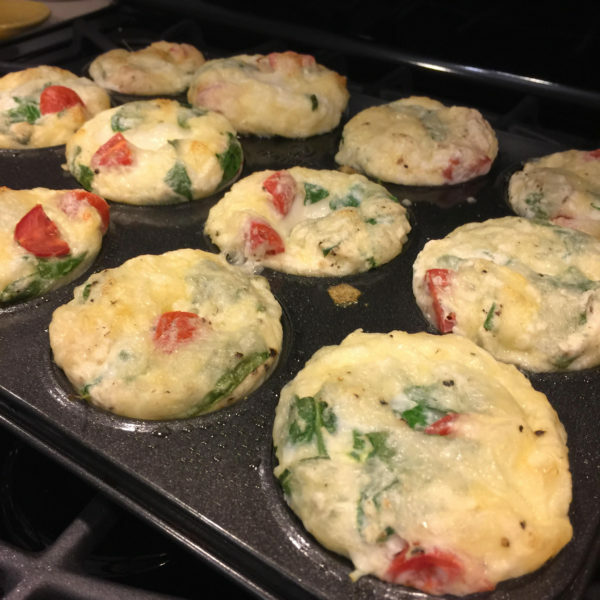 Here’s a fun Veggie Egg Muffin recipe I’ve made before from ShowMeTheYummy.com. You wanna know what’s awesome?! Each egg “muffin” is less than 50 calories, and makes for a great partner to toast, fruit or yogurt. Even better! It’s less than half an hour from cracking the eggs to pulling the muffins out of the oven. Chop your veggies: red pepper, green pepper, yellow onion, mushrooms, and baby spinach. Next, mince garlic and crack the eggs! Whisk the eggs together in a large measuring cup and set aside. Now, heat a non-stick pan over medium heat. Sauté for about 5-7 minutes, or until the peppers are tender. Add in spinach and mushrooms and cook for another 2 minutes. Pour the cooked veggies into the whisked eggs. Stir to combine. You can keep these in the fridge for about 4-5 days (or 3-4 months in freezer), which is PERFECT for healthy breakfasts throughout the week. Let them cool completely before placing them into sealed airtight containers. OUR STORIES | breakfast, eggs, Foodie Friday, low calorie, muffins, recpie | February 8, 2019 .